When taxpayers file their tax returns this time next year, four out of five will likely see a smaller tax liability than they do today, due to major tax legislation enacted last year. But these savings to taxpayers will be nothing more than a mirage: after accounting for the true cost of this legislation, what looks like a free tax cut today will turn into a massive tax increase on the middle class tomorrow. For years, policymakers in both parties have supported reforming the tax code by eliminating so-called “tax expenditures” (provisions in the tax code that reduce a taxpayer’s tax liability if they engage in certain preferred behaviors) and using the savings to reduce tax rates. Donald Trump and Congressional Republicans, however, were unable to tackle tax expenditures to the degree necessary to offset their desired rate cuts. Instead of paring back their ambitions or working with Democrats on a bipartisan tax reform bill, the GOP opted to abandon revenue-neutral tax reform and pursue a package of deficit-financed Trump tax cuts. Many Republicans argued that their tax bill (formerly known as the Tax Cuts and Jobs Act before it was renamed for procedural reasons) would generate enough economic growth to pay for itself. But according to the non-partisan Congressional Budget Office, this legislation will actually cost nearly $2 trillion over 10 years. Even CBO’s official estimate understates the true cost of the Trump tax system, as Republicans set arbitrary expiration dates for many expensive provisions to minimize the bill’s official cost and subsequently enacted additional tax cuts. 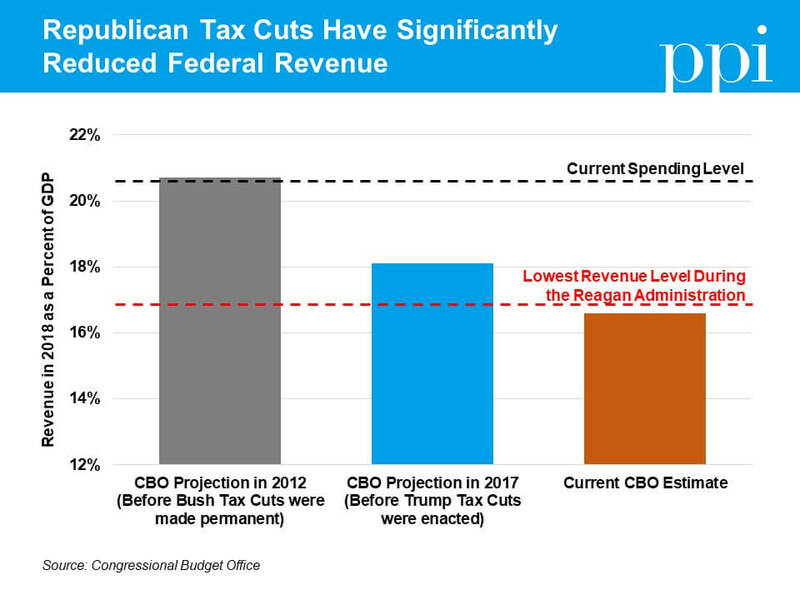 If current tax policies are made permanent, as many Republican leaders intend to do, CBO estimates that they will increase deficits by roughly $3 trillion over the 10-year window. This game is one the GOP played before. In 2001 and 2003, President Bush and Congressional Republicans enacted costly tax cuts that were set to expire after 10 years. But in 2013, over 80 percent of the Bush tax cuts were made permanent, dealing a major blow to federal finances. The Trump tax system is imposed on top of these tax changes, further reducing revenue in 2018 to the point that revenue as a percent of gross domestic product (GDP) will be below where it was at any point in the Reagan administration. Unlike the Bush tax cuts, which were enacted when the federal budget was in surplus, the Trump tax system takes an existing budget deficit and makes it even worse. Spending is 3 percent of GDP higher today than it was in 2001 thanks to the growth of mandatory spending programs, which are those with funding determined by formula rather than congressional appropriations. The largest of these programs, Social Security and Medicare, are projected to grow twice as fast as the economy over the next decade as more and more baby boomers move out of the workforce and onto the benefit rolls. By 2026, thanks to the combination of tax cuts and rising spending, every dollar of incoming revenue will be spent on mandatory spending programs and interest on the debt. Every dollar Congress appropriates thereafter for national defense; public investments, such as infrastructure and scientific research; or basic functions of government, such as our courts system and law enforcement, will be borrowed money. At some point, this borrowing will become unsustainable and policymakers will have to reduce deficits with spending cuts, tax increases, or some combination of the two. The American people will be the ones who must foot the bill for these policy changes and those costs will dwarf the benefits of whatever tax cut they see this time next year. According to the Urban-Brookings Tax Policy Center, the cost per household of the debt incurred to finance the Trump tax system in 2018 alone is $1,610. If the burden of future deficit reduction is spread evenly, every household that receives a tax cut of $1,610 or less in 2018 will effectively be getting a tax increase over the long-term. When accounting for this impact, it becomes clear that the Trump “tax cuts” are essentially a massive tax hike on those who can least afford to bear it. Of course, the burden of deficit reduction is unlikely to be equally shared. Older Americans, who are likely to exit the workforce or pass away before the debt comes due, will reap all the benefits of tax cuts now and pay little of the cost. Future workers, on the other hand, will bear the brunt of deficit reduction later without receiving any benefit from the tax cut today. 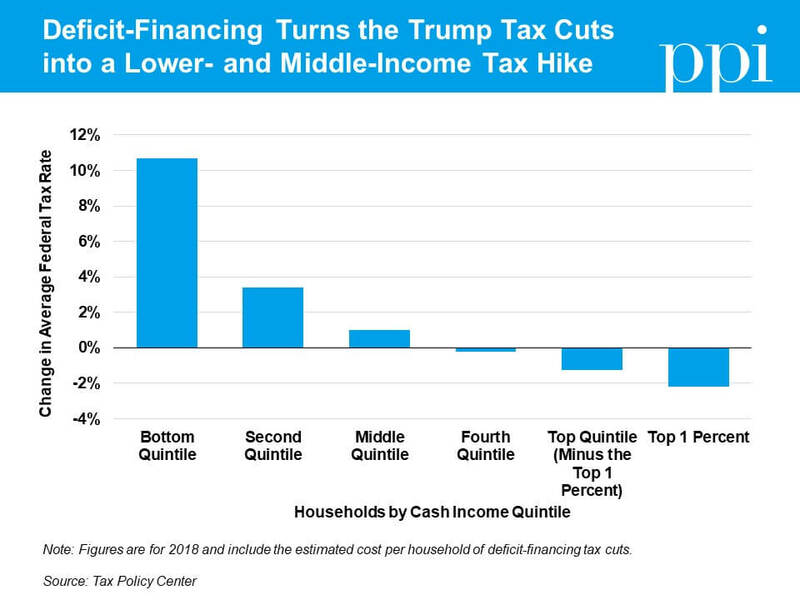 Moreover, as Tax Policy Center notes in their analysis, if deficit reduction is predominantly done by cutting welfare spending that benefits low-income beneficiaries, the Trump tax system plus its financing will be even more regressive than it appears in the chart above. The American people are acutely aware of these trade-offs. Prior to the implementation of the Trump tax system, several polls showed that voters across the political spectrum – including most Republicans – wouldn’t even support cutting their own taxes if it meant increasing federal budget deficits, let alone those of the ultra-rich. Policymakers should immediately replace the irresponsible Trump tax system with real tax reform that puts our money to better use elsewhere.